Ticket To Ride is a pretty popular game at my house. If we are not playing it at the table, chances are that I might be sneaking in an on-line game. There are a couple of variations on the original which each have a few additional rules, making game play fresh and forcing players to adopt new strategies. 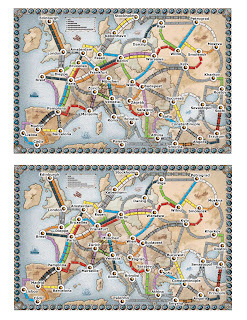 I have played Ticket to Ride: Europe online a few times but never with real people until recently. Downtown Comics had a 25% discount on boardgames in January and last pay day I could not resist the urge. I know it is just after Christmas, but what the heck. We played and it is a lot of fun. It's much more than a new map. There are lots of new features like tunnels, ferries and train stations. It's a stand alone new game, not an expansion. It allows for five people and takes any where from a half an hour to sixty minutes to play. All of the cards are full size which means they are lot easier to shuffle than the small cards that came with the original Ticket. The game feels different than the original. There are a lot more shorter routes, the focus is on the center and there are many more ways to get from point a to b. There are a lot more routes but they are more spread out. There is a variation in the destination cards. There six long route cards valued at 20 or 21 points that are really long trips. At the start of the game you get 3 normal route cards and one long ticket. All the unused long route cards get dealt out. You get just one chance to accept one. There are two new special types of routes in this game, tunnels and ferries. This is the big departure from the original ticket lies. Tunnels might take more cards than the number of spaces on the board. When you decide to claim a tunnel route you lay out your cards, then flip up 3 cards from the draw deck. Any cards that match your selected color mean that you have to play that many more cards of the appropriate color to finish the route. If you can't, you take your cards back into your hand, having effectively lost your turn. You can try again next turn, if you desire. Ferries are gray routes which show one or two engines on the track. When you lay out the appropriate number of cards, it must include at least that 1 or 2 engines. The other big difference is the train stations. You select a city without a station in it currently, then you play 1 card if it's your first station, two matched cards if it's your second, and three matched cards if it's your third. Stations will help you connect routes in the endgame, but playing them loses you points. This a cool new addition because it is much harder for your opponents to cut off your routes meaning you should be able to complete them. The game ends when one player has two or less trains in your hand. It is a fine addition to our game collection and I encourage you to try it. If you're in the St. John's area and you play Ticket or want to learn, drop me a line. We are always looking for new players.